Members of the Governor’s Cup District 3 champion McCracken County High School academic team are (front row, from left) Bailey Bowland, Hannah Hatton, Ava Kelly, Ella McBee, Noah Ellis, Sydney Woodard, Barrett Wagner, Ava Chuppe, Katelyn Woodard, (back row from left) Olivia Dodge, Ethan Roberts, Josiah Bau- mer, Grant Eyer, Alec Ramos, Reese Bell, Mason Wooten and Jacob Harris. 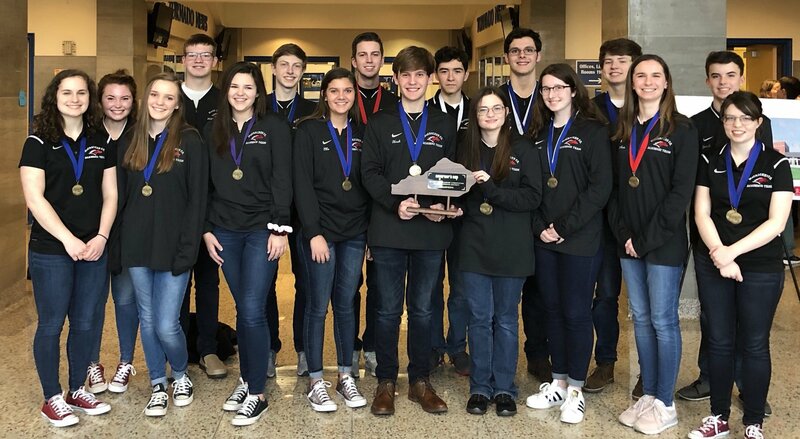 For the fifth straight year, the McCracken County High School academic team has won the District 3 title in Governor’s Cup competition. The Mustangs have won the district championship each year since 2015. In 2014, when the school was in its first year, the team placed second to Paducah Tilghman. McCracken County won the District 3 competition Jan. 22 and Saturday at PTHS with a score of 66 points. Paducah Tilghman was second with 41 points and St. Mary was third with 12 points. Paducah Tilghman also earned the Hume Sportsmanship Award. The competition consisted of a quick recall competition, a future problem solving competition, composition and assessment tests in five subjects: math, science, social studies, language arts, and arts and humanities. Composition and the future problem solving competition took place Jan. 22, while assessments and the quick recall competition took place Saturday. The top two teams in quick recall and future problem solving and the top five students in composition and each assessment test advance to the Region 1 competition, to be held Feb. 11 and 16 at Murray High School. Region 1 consists of Districts 1 through 4. McCracken won the quick recall competition and the future problem solving competition, while Tilghman placed second in each competition. • Composition: 1. Madeline Kerr, St. Mary; 2. Dorian Record, St. Mary; 3. Kate Criner, Paducah Tilghman; 4. Katelyn Woodard, McCracken County; 5. Shelby Durham, Paducah Tilghman. • Math: 1. Lance Butler, Paducah Til- ghman; 2. Mason Wooten, McCracken County; 3. Alec Ramos, McCracken County; 4. Ryan Chua, Paducah Tilgh- man; 5. Josiah Baumer, McCracken County. • Science: 1. Mason Wooten, Mc- Cracken County; 2. Ella McBee, Mc- Cracken County; 3. Austin Yarbrough, Paducah Tilghman; 4. Travis Trimble, Paducah Tilghman; 5. Ryan Chua, Paducah Tilghman. • Social studies: 1. Noah Ellis, Mc- Cracken County; 2. Grant Eyer, Mc- Cracken County; 3. Reese Bell, Mc- Cracken County; 4. Tyler Truitt, Paducah Tilghman; 5. Nadia Pacheco, Paducah Tilghman. • Language arts: 1. Sydney Woodard, McCracken County; 2. Ava Chuppe, McCracken County; 3. Paige Kight, Paducah Tilghman; 4. Eileen Sember, Paducah Tilghman; 5. Grace Raber, Paducah Tilghman. • Arts and humanities: 1. Sydney Woodard, McCracken County; 2. Paige Kight, Paducah Tilghman; 3. Barrett Wagner, McCracken County; 4. Ava Kelly, McCracken County; Tyler Truitt, Paducah Tilghman.